More importantly, as (pretentious as it sounds) food blogger I do want to be pigeon holed. Pigeon Holed? Well in arty or design type careers people become known for ONE style, whether it be an acting style or food stuff, which prevents them from branching to other styles thus is stuck in their own success. Others may be happy to be known for a particular style and good on you! None the less, I would like to speak out for those who want to extend beyond the savory/ sweet blog that they have. I remember a conversation I had with another food blogger that they particularly had a difficult time getting views for their savoury recipes. Now I looked at this recipe and I thought it was just as good as their sweet recipes. It made sense, had a good balance of flavours and the photography was stunning. Problem? They were a sweet blog. Now some people may think I am being greedy, wanting to be a jack of all trades, but as a baker/ cook I would like to think my culinary skills can extend beyond the craft of sugar, flour and butter. Some bloggers have successfully done this. I am not denying that it cannot be done however I would like to think it would be easier than it really it. Maybe next time you view food blog; try to look at the recipe before looking at the brand behind it. Just because they are branching out beyond their normal style; does not mean that recipe is bad or is not going to work. Actually I have found that a lot of sweet bloggers can COOK some mean chilli and have produced a recipe for a roast that is better than more trusted recipes on the net. I have made it no secret that I love cheese and intensely savoury snack foods. I might have developed this taste for dude food from my dad. Everyone always says that I am more like my dad than my mum; I guess this relates to my taste buds too. Anyway besides this love of cheese and bread; I also have a thing for stews in particular red tomato based ones. I have no idea what it does to me but the comforting glow of red stew can warm up even the darkest of days. 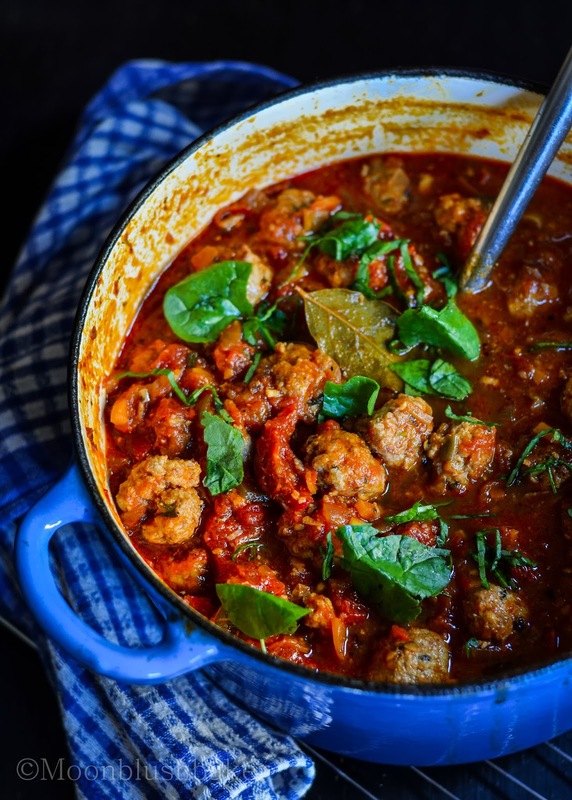 I admit this recipe is not original; in fact this probably the cheat version of meatballs in tomato sauce. 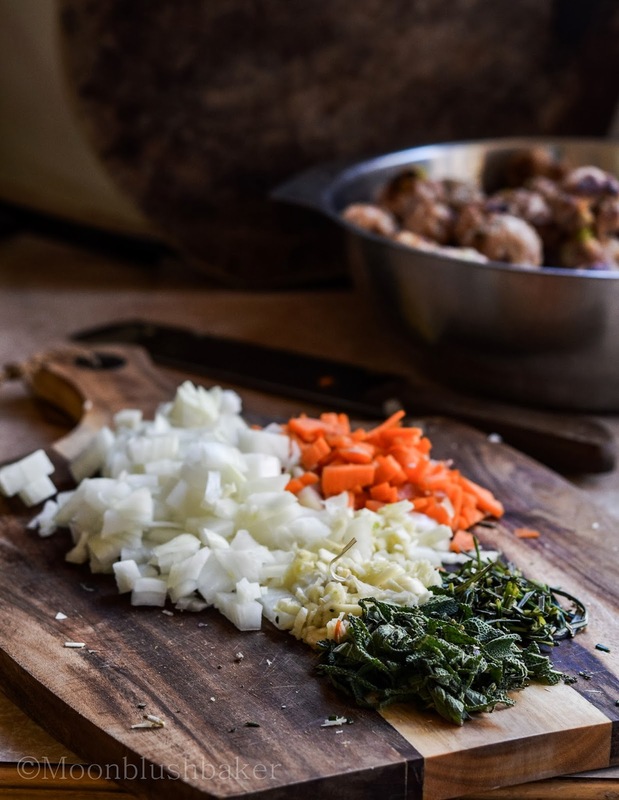 However all the tips and tricks I have learned over the years from many cooks go into this stew which can be whipped up in a matter of moments. Not the mentions if you have time to ponder on the weekend; make a heap load and freeze it. This means this meal can be an instant Hangry crusher (savour when you have a dad like mine). I am going to list all the tricks I have used here. 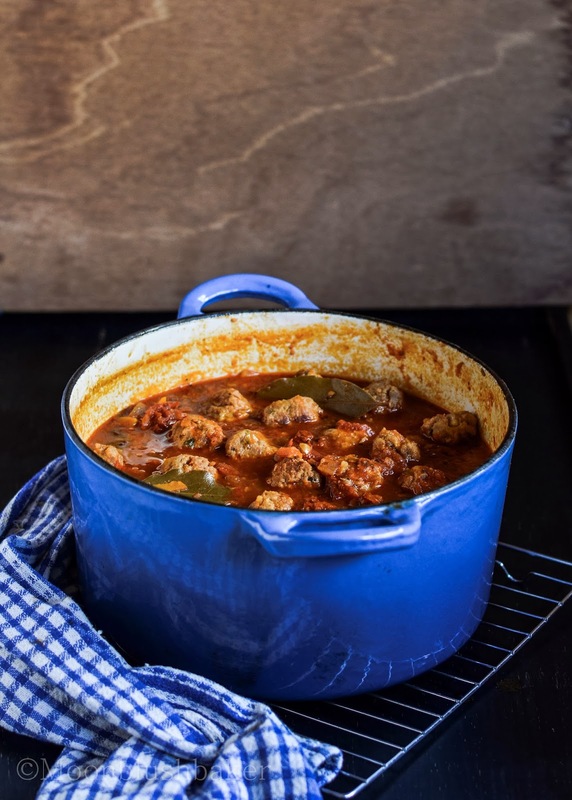 While I know some of them are not new; they help even the worse of cooks (me) make meatballs which are delightfully light but are able to meld with that cohesive, thick tomato sauce. Mix fresh pork fat with lean pork mince. Caramelising Onions with a star anise. Using a combination of fresh, sun dried and can tomatoes. Using SOY SAUCE to season. DO not be gentle with the herbage. Adapted from many cooks and real life tips. 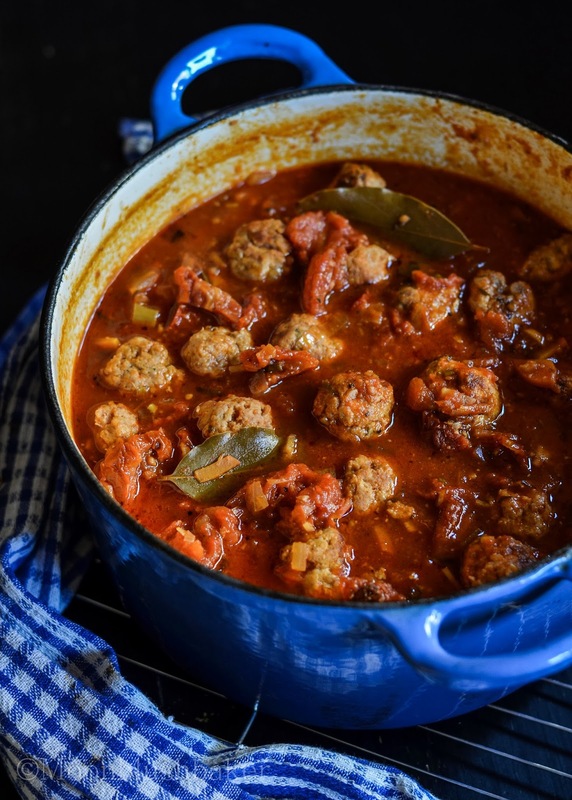 Combined all the meat ball ingredients in a large bowl. 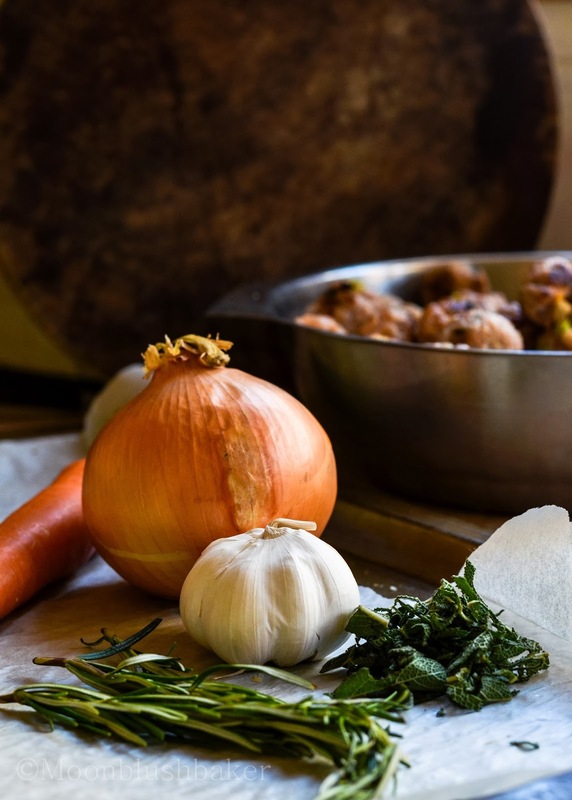 Form each meat ball in to a 2cm round and place on a lined baking tray. Set aside. Heat 1 tbsp oil in a large frying pan over high heat, add meatballs. Reduce to medium low and cook for 5 minutes on each side or until cooked through. Set aside in a clean bowl. For tomato and olive sauce, heat olive oil in a heavy-based saucepan, add onion, jam and star anise and cook for 5 minutes or until soft. Remove star anise. Mix in carrot, garlic, sage, mixed dried herbs and rosemary and heat for 4 minutes until coated in onion juices. Add can tomatoes, fresh tomatoes, sun dried tomatoes. Fill one empty tomato can half way with water and wash out the left over juice from all three cans. Pour this into the sauce. Add stock and wine. Reduce the heat down to low and simmer for 15 minutes. Add tomato paste, stir through. Season with soy sauce, freshly ground black pepper and brown sugar. Bring to the boil, reduce heat and simmer for 5 minutes or until starting to thicken. Finish with brown butter. 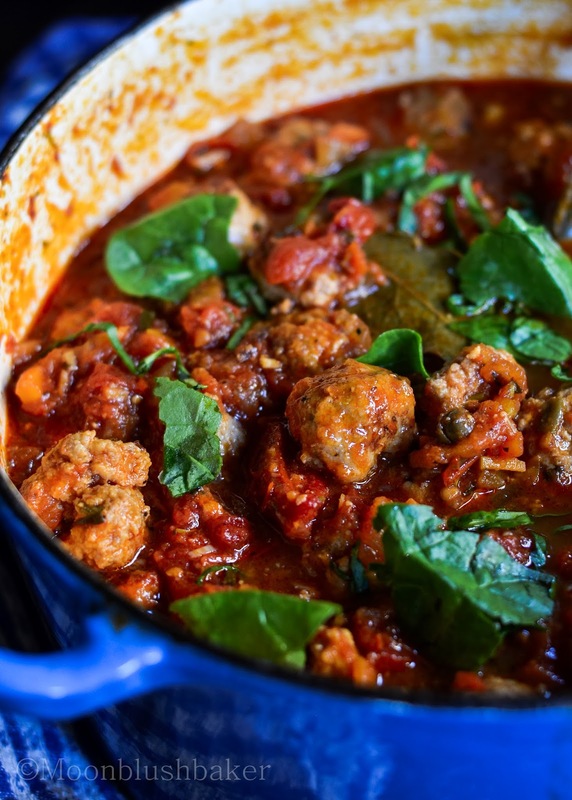 Return meatballs to tomato sauce and simmer for 5 minutes. Add more seasoning if need and top with freshly chopped basil and sage. Ooo that looks delicious! I love meatballs, and I enjoy sundried tomatoes. Your photos look incredible. What camera/lens do you use? I use Nikon 50mm f/1.8 AD lens; so it is not anything fancy. Love this and it’s perfect for this cold weather we’ve been having in the states. I hear it is freezing over there! I hope you guys are going ok, I am worried about the hazard of conditions. So love the variety of tomatoes in your sauce – it sounds totally delectable! Yes that is key to the sauces colour and taste. This may not be a dessert, but it looks super delectable! Thank Laura, you comment means lot especially since this is a savory recipe. These look simply fantastic, really good for this time of year and so full of flavour with the different tomatoes. I also love your photography, by the way! I feel for the states right now, You guys must be freezing over! Hopefully this would warm a few hearts over there. 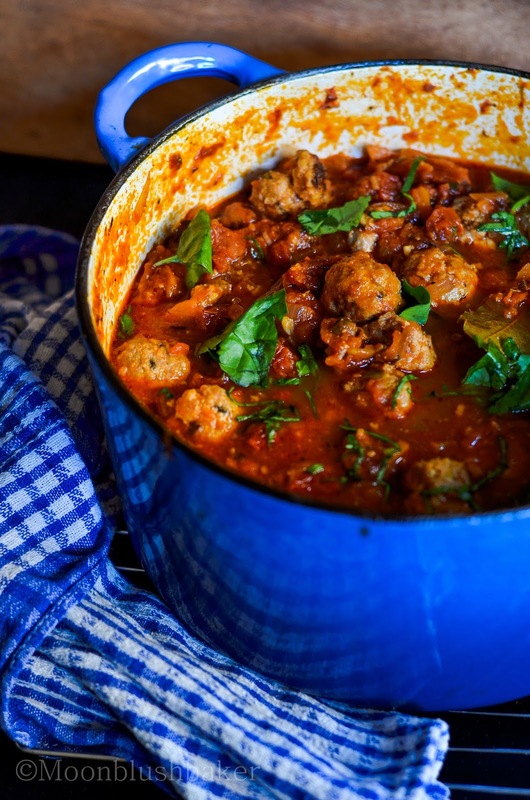 Your photos make these meatballs look delicious! 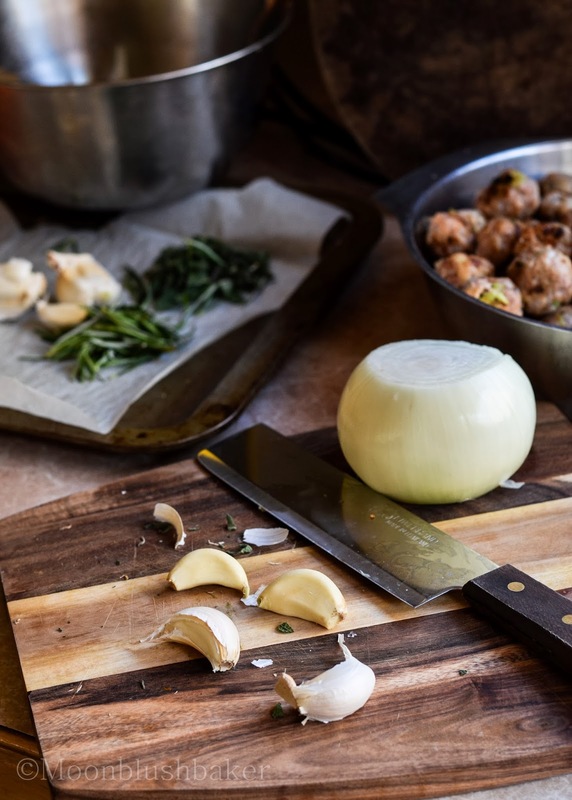 I love your tips for making things tasty, too … totally agree! I’ve often wished I’ve added more herbs than a recipe says, for example! hahaha, I learnt that trick from Jamie Oliver. Have you seen the amount of herbs in his food but it taste fantastic!